Things are moving fast at Travis CI. Some changes are visible (six(!) new members of our growing team and the UI improvements — more on this below), and some are not so visible (like emphasis on the new container-based infrastructure, and behind-the-scenes API improvements). 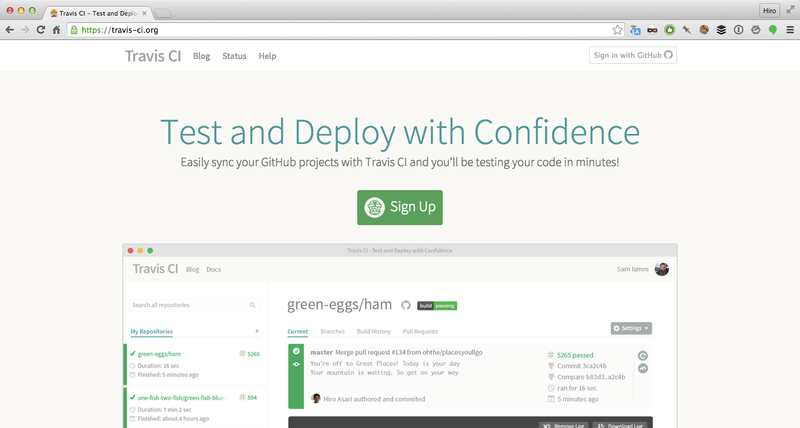 We want to let you know what Travis CI is up to with these regular updates. You have undoubtedly noticed the recent changes to our web pages. The overall theme is flatter; the focus of these updates to make information easier to find, along with some eye candies like favicon (sorry, Safari users, you won’t see them) which changes according to the build/job’s status. We have also beefed up the landing page. If you are logged in, please sign out, and see it for yourself! These changes are great on their own merit, but we are not done yet. These lay foundations for future updates we have planned. We plan a more detailed blog post. Stay tuned! As we just announced, recently activated repositories will run on containers by default, unless they are explicitly opted out with sudo: required. The container-based infrastructure provides a better overall experience, with shorter wait and more capable VMs. Currently in early alpha stage, this setup is showing some promising results so far. Rails Girls Summer of Code returns for the third straight year. Anika Lindtner, Sven Fuchs, Laura Gaetano, and Sara Regan are hard at work to make this another smashing success. If you have not done so, I encourage you to donate today! Among many small updates announced, the highlight is MySQL 5.6, provided by Ubuntu packages from dev.mysql.com. While MySQL 5.6 brings you many new features, if you need to stay on 5.5, be sure to follow the instructions given in the announcement above. You might be wondering, “What about the Mac?” I’m glad you asked! We are in the process of investing in a new Mac cloud infrastructure that brings us, and you, some great features and improvements. Our current focus is not just on stability, but also the ability to offer our users a faster turnaround for new Mac images. We are working hard with our infrastructure partner to make this all possible, just at a time when Apple has been releasing Xcode betas and updates to the Swift programming language. We have been conducting a beta test with Xcode 6.2 on the new Mac cloud. These beta testers have helped us identify and fix some important issues, and for this we can’t thank them enough! The capacity is limited for the beta testing, so we are unable to add more users to it while we bring more capacity online. As for Xcode 6.3, due to it requiring OS X 10.10, we hope to have good news next week. Watch this space! We appreciate your understanding on this issue, and thanks for being awesome. These don’t merit special mentions or a separate blog post, but are interesting nonetheless. Ruby VM now respects .ruby-version file, and uses the Ruby runtime defined in it. A new build phase before_cache is added. You can use this phase to prepare the cache before it is checked for updates. This is useful for cases where a utility touches a small file, which would mark the entire cache as new without interference. We will talk soon, but until then, happy testing!